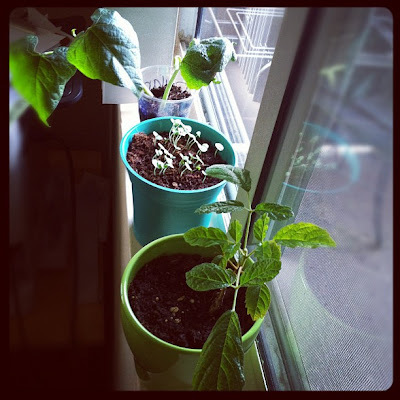 Life with Dylan: How does your garden grow? I wouldn't say that I have the greenest thumb, but it's at least a shade of green and I'm willing to keep trying. I love getting my hands dirty and feeling the earth when I'm planting. I have always had house plants, but living in an apartment doesn't make it easy to attempt the garden of my dreams. It must be some type of container garden. Luckily my son has had good luck with plants and currently has a nice windowsill garden growing. His lima beans were one of three that actually grew out of the entire third grade class and his basil is doing quite well. The little seedling that he brought home from school is also growing quickly. He told me that it is a Golden Trumpet tree - I guess only time will tell. This weekend we are heading down to San Diego to attend the Garden Festival at the San Diego Zoo in hopes to learn a few gardening tricks and venture outside of the windowsill. Maybe design a little balcony garden. Oh, and of course we are going to see the animals too! Do you have a garden? We would love to see pictures of your garden. Tweet your garden pictures to @bchbby and maybe we can get a little inspiration from you. Check out the lasagna gardening technique, you can even do it in large cardboard boxes on your balcony and you can make it pretty with burlap, etc. but it is a super easy way to get a new outdoor garden area going without the expense of buying large pots, etc.